While the unemployment rate is lower today than it was one year ago, many would-be workers are still looking for employment, and many currently employed workers are wondering whether now is a good time to start up their own businesses. 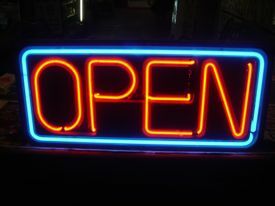 According to the Small Business Administration, more than 500,000 new small businesses open their doors every month. Unfortunately the survival rate isn’t nearly as good, but for those with a knack for small business management, opening a new business can do more than provide employment. But what’s involved in small business management and what does it take to start a new business? Opening a new business isn’t for the timid, and the process actually involves a fair amount of risk for the entrepreneur. Not every business will succeed, of course, but in terms of small business management, there are things you can do to help ensure that your business will survive the test of time. Create a business plan.The old adage, “If you don’t know where you’re going, any road will take you there” is very true when it comes to opening the doors of a small business. Absolutely no harm comes from planning, and the more planning you do, the better prepared you will be when the time comes to open your doors. If you don’t know how to write a business plan, work with a consultant or someone who has put together business plans in the past. The experience of sitting down and thinking out your small business management strategy is well worth the time and effort this exercise will take. Having a business plan in hand will also help if you need to ask for loans or financing for your business. Find local small business resources. Many state, county and city governments have free small business management resources available as part of their economic development efforts. Working with professionals who can provide counseling and guidance can be invaluable, and can save you a lot of time and effort. It may also help you build connections in your local business community. Location, location, location! Depending upon what kind of business you operate, you’ll need to find space to work. Whether you work from a home office, need retail space or need a production facility, choosing the location of your business can make a big difference. If your business will rely on employees, you’ll want to locate your business in a place where workers can get to it easily, and where skilled workers are readily available. Be sure you have enough space to conduct business. In terms of small business management, choosing a location will mean that you’ll also need to make decisions about whether you want to lease or own your facility. Form your business. Consult with an attorney about the legal structure of your business. In limited cases, a sole proprietorship will work just fine, but in most cases, you’ll want the legal protection that comes with some form of corporate structure. This is one area of small business management where you’ll definitely benefit from working with an experienced attorney. An attorney can help you form your corporation, file the necessary paperwork and establish your business in the legal sense of the word. In my next post, I’ll take a look at more small business management tasks associated with starting your own business.